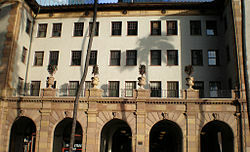 Dillingham Transportation building was built in downtown Honolulu in 1929 by industrialist and businessman Walter Francis Dillingham and was added to the National Register of Historic Places in 1979. The building’s charm and character of art deco patterns, multi-colored marbles and bricks, and paneled beams of red, gold, black and green designs are a beautiful example of the Mediterranean revival/Italian renaissance architecture that was popular in the 1920s Hawai`i. With the authorization of King David Kalakaua, Ben Dillingham, Walter’s father, broke ground for the Oahu Railway & Land Co. (OR&L) and officially opened the railway on the King’s birthday: 11/16/1889. 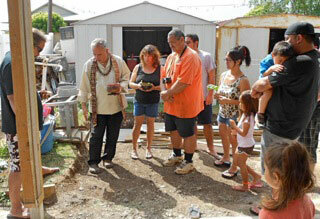 He leased lands in Ewa and Kahuku on O`ahu where he established sugar plantations. From 1889 to 1947, OR&L connected several sugar plantations around the island carrying passengers and freight. Sugar became a phenomenally profitable industry for the state of Hawaii creating great fortunes for the Dillingham family. The hale (house) represents one of the most important means of ensuring the safety, wellbeing and very survival of the `ohana. It provides a place of shelter, protection, security and sanctuary. It serves as the central gathering place for family, relatives and friends to affirm their bonds of kinship, share aloha (love) and celebrate their spirituality. 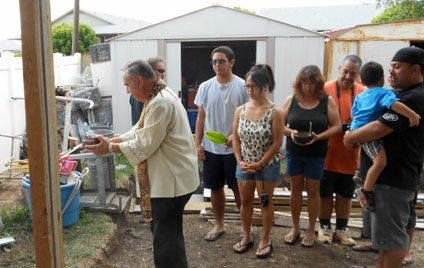 In modern Hawai`i as it was in old Hawai`i, it is customary to consecrate the foundation of one’s future hale (home) with a religious ceremony before its construction. In ancient times, before building the hale, the po`o (head of the household) would consult a kahuna kuhikuhi pu`uone, (literally: one who points out the sand dunes) a seer who was an expert in selecting proper building sites. He studied the `āina (land), topography, geographic and weather conditions in order to select a good site to build. Similar to the Chinese practice of Feng Shui geomancy, the kahuna also followed the laws of nature, heaven, earth and the elements to advise the owner about all the important matters involved such as where the home should be situated and in what direction it should face. Such things as planting trees or positioning other buildings directly in the line of the front doorway of the home were considered `alai (obstructions) preventing blessings from entering the home. People believed that the `ohana (family) in a home that was not built properly in accordance with the guidance of the kahuna, would be subject to sickness and misfortune of all kinds. The early Hawaiians believed that it is the `ohana that brings life into a home. Therefore, once the construction of a hale is completed, a ceremonial blessing is customarily performed with the owner(s) and their immediate family present. As part of the consecration rites, members of the household are invited to impart their gift of mana (supernatural energy) and take spiritual as well as physical possession of the residence. Once the dedication is completed, a ceremonial Hawaiian feast is held to give thanks to Ke Akua (the Higher Power) and to welcome invited guests who have come to honor the occasion.